Bai Haishan, working in clinic for more than 20 years, has accumulated rich experience of clinical cancer treatment from differential diagnosis of intractable cases. He is accomplished in diagnosing and comprehensively treating cancers like breast cancer, liver cancer, lung cancer, stomach cancer and colorectal cancer, etc and has profound scholastic achievement in minimally invasive targeted therapy research. Director Bai upholds the principle of being humane and individualized and focuses on patient-oriented concept to take patients’ best interests into consideration. While making the treatment plan, he always bases on patient’s individual condition, pathologic type and stage of the cancer, combining with his rich medical treatment experience. Director Bai has treated more than 2,000 cancer patients and gained compliments from patients. 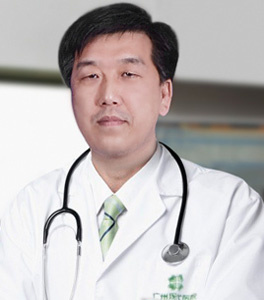 In 1992, director Bai graduated from Baotou Medical School. During July 2002 to July 2003, director Bai wen to the Sun Yat-sen University Cancer Hospital for further study of minimally invasive therapy. Director Bai has worked in clinic for more than 20 years. Director Bai takes parts in academic research constantly. He has been invited to Beijing, Shanghai, and many other national medical technology-leading cities to attend cancer conferences, minimally invasive therapy meetings.